1 of 1 Whisk vinegar, mustard, salt and pepper in a large bowl; slowly whisk in oil. Let stand. 1 of 3 Prepare corn muffin mix in 8-inch square baking dish according to package directions. Cool completely, then cut into 1-inch cubes (5 cups). Heat oven to 400 degrees F. Place cornbread cubes in a single layer on a baking sheet and bake, stirring once, 8 to 10 minutes or until lightly toasted. Cool. 2 of 3 Bring a large pot of salted water to a boil. Add corn and cook 5 minutes. Add beans andcook 3 minutes longer or until beans are crisp-tender. Using tongs, remove the corn and rinse under cold running water. Drain beans and rinse under cold running water. Cut corn off cob (1-1/2 cups kernels). 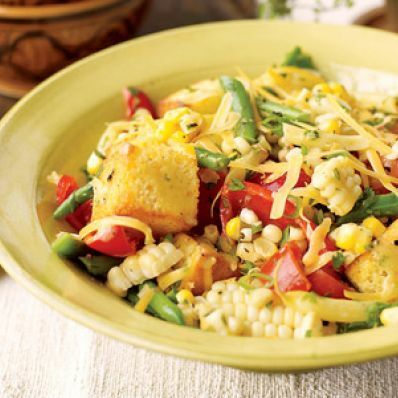 3 of 3 In serving bowl combine beans, corn, cheese, tomato, pepper, scallions, basil and dressing; toss to combine. Add cornbread and toss gently. Serve immediately. Per Serving: 410 mg sodium, 5 g fiber, 16 g pro., 311 kcal cal., 15 g Fat, total, 34 g carb., 6 g sat. fat, 38 mg chol.